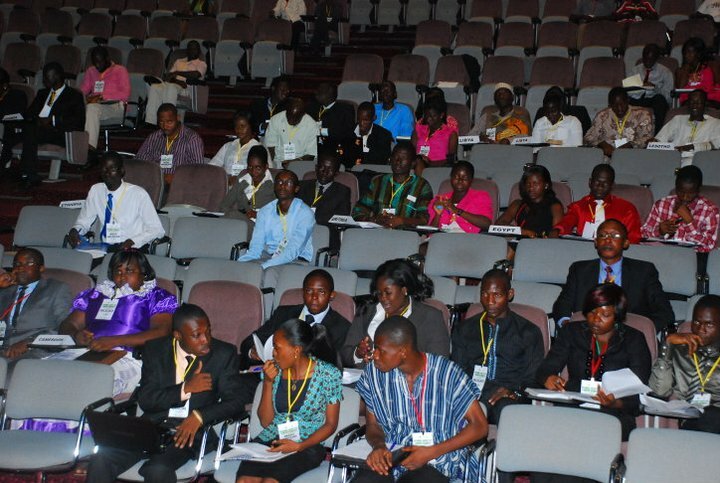 Accra , May 26 2011 – A Model African Union (AU) Summit was held in Accra on Thursday to commemorate the 48th Anniversary of the AU Day with the focus on youth empowerment. The summit focused on High level consultation on youth development issues was organized by the Ministry of Foreign Affairs and Regional Integration at the International Conference Center in Ghana. 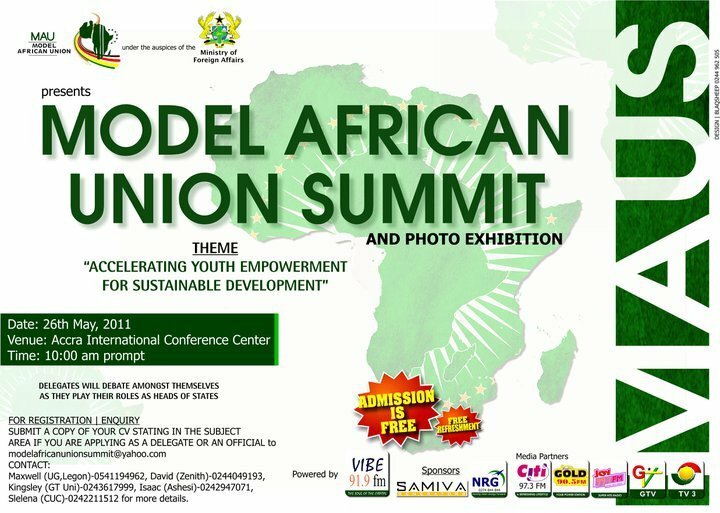 This summit was the first official Model African Union Summit for the African Union starting 2012. 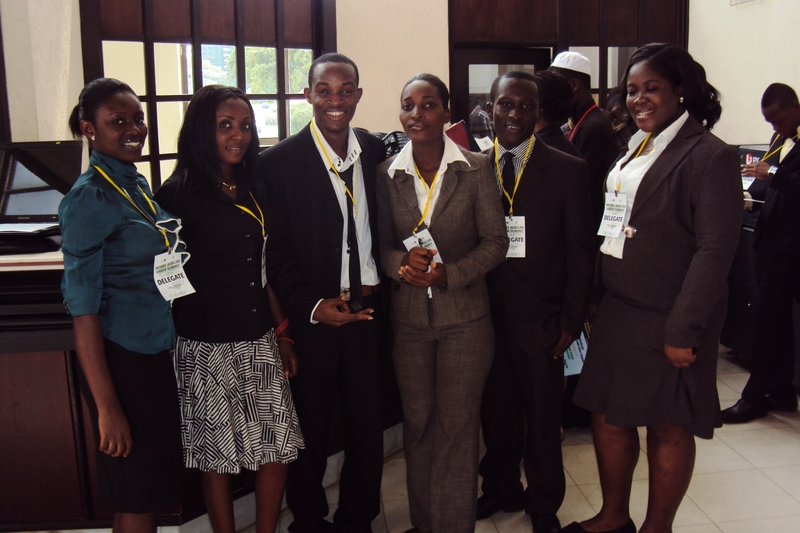 Organized by the Human Resources, Science and Technology commission of the African Union in Addis Ababa, 1st – 9th April 2011, the forum was held under the same theme as the African Youth Summit: ‘Accelerating Youth Empowerment for Sustainable Development’. The one-day summit, attended by 143 delegates from AU Member States, provided a platform to deliberate on issues affecting the African youth. 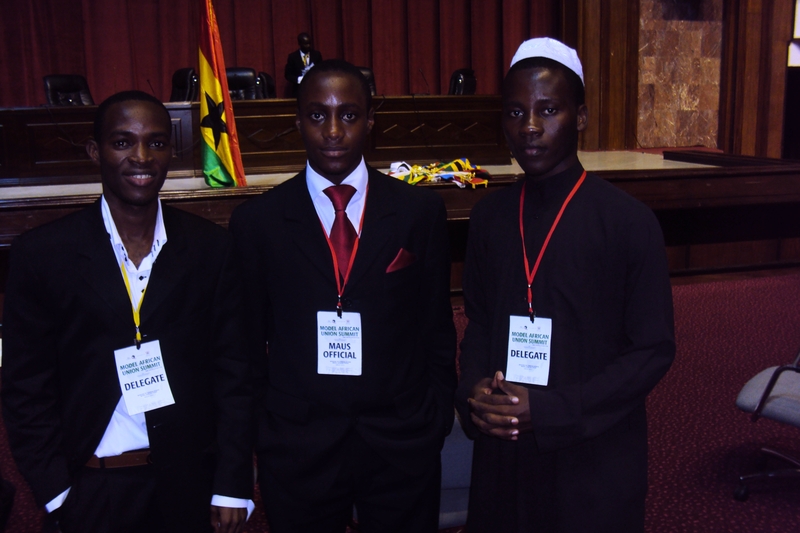 Participants constituted Youth Leaders in Ghana and other youth engaged in Diplomacy across Africa including Joseph M D Johnson, African Youth Volunteer and Youth Advocate of Liberia. Johnson was selected as an official delegate by MAUS Commission to represent Liberia as Head of State stimulating Youth Empowerment dialogue at the summit. Days before the summit, selected delegate were sent information and guidelines followed by a letter by the Under Secretary General for the summit Management – Elorm Quarshie – with an annex on the scope and format of the summit by the Chair and Vice Chair and Secretary of committees. Liberia was placed in ‘committee 2’ and was joined by Hans Peter Nyarko, a Liberian student in Ghana and three other Nigerian youth leaders under the Topic: Peace and Security Council. The basis of the summit was that the Ministry of Foreign Affairs of Ghana highly regards youth as an important resource that must participate in decision making with issues relating to their progress. Essentially, Ghana’s action to initiate MAUS 2011 to commemorate the 48th Anniversary of the AU Day is an evidence of ‘establishing or reinforcing mechanisms that would facilitate and popularize active and meaningful youth participation in the development and implementation of global and national plans such as the MDGs and Poverty Reduction Strategy Programs (PRSPs),’ as part of the call to the AU Heads of States and Governments from Pre-Summit African Youth Forum resolution held in Addis Ababa, 1st – 9th April 2011. Sub-themes of the summit where “Diffusing The Cause Of Political And Religious Extremism Amongst Tribes And Youth, Rethinking Governance Frameworks And The Development Agenda To Promote, Resolutions for Education, Trade, Employment and Culture and ‘Accelerating Youth Empowerment for Sustainable Development’. Issues of trade barriers for regional integration and how to empower the youth through information communication technology were also discussed. On peace and security on the continent, Mr Abdul Moomen Muslim, Commissioner for Peace and Security of the Summit, observed that to achieve these, African Governments had to educate, provide employment and dispense justice without fear or favour. He called on African Governments to re-commit themselves to democracy, the rule of law and freedom of the press. As a Head of State representative, Joseph M D Johnson drew the attention of delegates to strategies the Liberian government is putting in place to advance education, youth participation and youth empowerment in a moment of numerous challenges as a post war nation. He suggested that the AU and African government should “monitor the implementation of the African Youth Charter and the Plan of Action for the decade through standardized tools, indicators and mechanisms for mainstreaming youth issues and monitoring progress towards development targets (ensure availability of youth comparative data for advocacy and programming),” as agreed in the from Pre-Summit African Youth Forum resolution held in Addis Ababa, 1st – 9th April 2011. One of the prominent honors that came out from the forum where outstanding presentations from four sections of the summit among which Liberia was listed. Outstanding delegates were congratulated. In a brief meeting with John Armah, Chairman of the MAUS 2011 summit, delegates selected will be called to take on a regional tour to equip and empower the youth on volunteerism among other issues. As part of a special package, Mr. John Armah assured delegates a Certificate from the Ministry of Foreign Affairs. Further presents will include books from EPP, Databank Offers, page markers, free refreshment, networking, tools from Democracy, Research Writing, Tools on Public Speaking and many other exciting offers all for free. Liberia, Algeria, Ivory Coast, and South Sahara being recognized for Outstanding MAUA 2011 Presentation, from right to left. 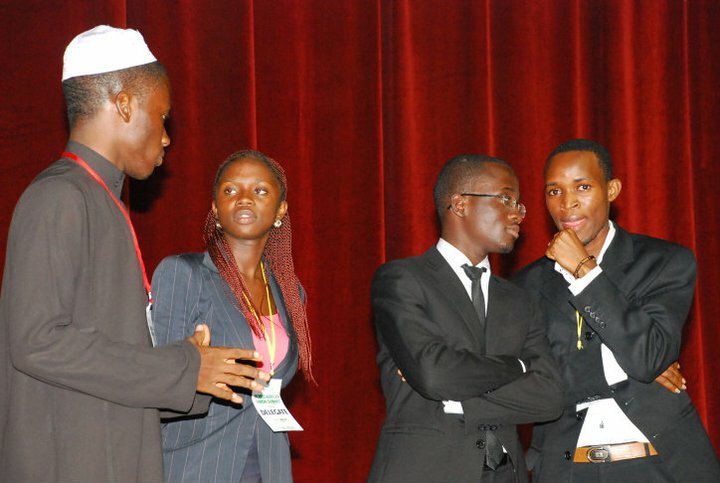 At the end of the summit delegates agreed to pass a document that will increase youth participation in Africa. Most of the delegates spoke on issues that are confront their nations and gave possible recommendations to increasing youth empowerment. Most importantly, many stressed the need for unity and peace in Africa. A censure was founded on an argument that delegates need more time to prepare and plan for their presentations. The summit was designed to engage young people in dialogue by participating in youth empowerment events and having enough time to drive into the purpose for which the summit was organized. Even though limitation of funds is a continuing part of organizing these summits, method of creating a platform for African youth voices to be heard clearly and loudly must be a significant aspect of such an event. Subsequently, the delegates appreciated the atmosphere of creating a friendly network between young people from different African backgrounds. For the first time, most delegates shared the experience of acting as a Head of State of their nation. Many agreed in the importance of decisions as proverb says, “Before you take any decision, consider its effect on the next seven generations.” MAUS 2011 created an opportunity for young people to understand the challenges and efforts leaders use to make decisions at international meetings for the success of their nations. Finally, unanswered questions were still roaming creating minds: what system can we have to enhance youth participation? What are social issues different from youth issues? How the youthfulness of the African population could be both an asset and an opportunity? Are these policies and rectifications really being implemented? 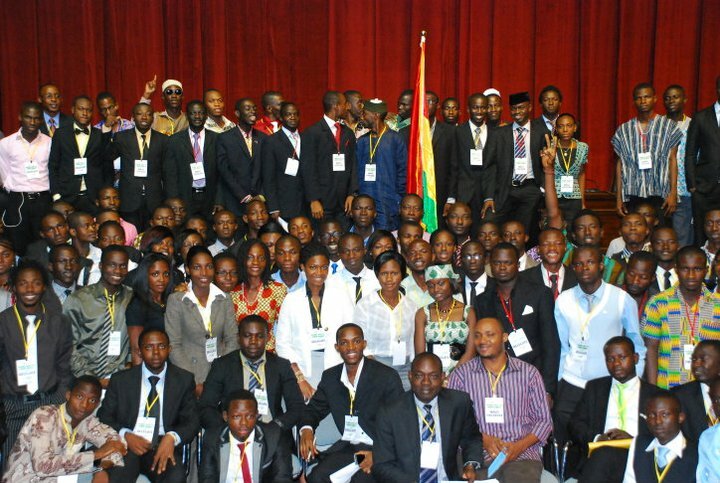 Are Governments investing towards African Youth Development? What can African Youths do to ‘Mobilize other colleagues to participate in national decision making process? How can African Youths participate actively in development processes at continental, regional and national levels? 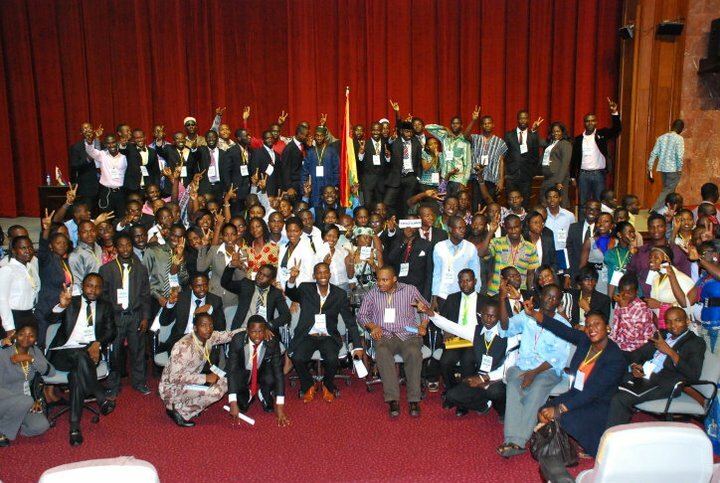 Is the future of African youths left in our own hands? These many other related questions were not addressed satisfactorily. Joseph M D Johnson, a Liberian youth advocate shortly studying at the Ghana Institute of Management and Public Administration – GIMPA and a certified African Union Youth Volunteer highly involve in youth empowerment activities. I participate actively in development processes at continental, regional and national levels and help engage leaders at these levels to prioritize youth development issues, youth participation, governance by advocating for the ratification, implementation and monitoring of the African Youth Charter. In support of the MDGs Goal 8: Develop a Global Partnership for Development’ have devoted my voluntary service to creating partnership with African Youth Ministries across the continent, endorsed by the Embassy of Liberia in Ghana during my studies, to strengthen the knot through dialogue and partnership. This commitment have driven my time and efforts to work along with youth organizations from different background, attending national forums, conferences, summits and high profile meetings.